What’s really interesting is that in the zones of high isopod activity, I have also been finding concentrations of what looks like a beautiful, finely granular worm castings material. I’m pretty sure it is their own version of “castings” (if you catch my drift – haha). Seeing how readily ispods breed/grow (probably more quickly than the worms), and finding all these “castings” deposits got me wondering how well they might “compost” food wastes on their own. While they certainly can help out in vermicomposting systems with excellent ventilation – breaking down larger chunks of (and more resistant) material – they’re rarely provided with their own “perfect” conditions (would be too dry for the worms). So I decided set up my own “ultimate” isopod bin, and to test out this “isopod-o-composting” (lol) concept for myself! My set-up is pretty basic. I simply found some hay bales with isopods living in them and transferred some of the material over to a large plastic tub. I then buried a bunch of cucumber slices (just to get the ball rolling) before adding a thick layer of newsprint strips on top. This is the only cover I will add since I want the system to stay fairly dry (in comparison to a worm bin). Once my new system was set up (I’ll be keeping it down in my basement, in case you are wondering), I decided to see if anyone else has posted about this online. What’s funny is I came across two interesting bits of content right away – both of them posted by friends of RWC! The first one is a video posted on YouTube by Larry “Garbage Guru” Duke, showing the unbelievable densities of isopods he had in an active worm bed. I’ve never seen so many spread throughout a system – but I have been finding similar concentrations in certain sections of the hay bale beds. The next posting was made by “Dermy” (who has commented quite a bit on the RWC blog, and with whom I’ve had a number of email exchanges) on something called “The Bug Forum”. 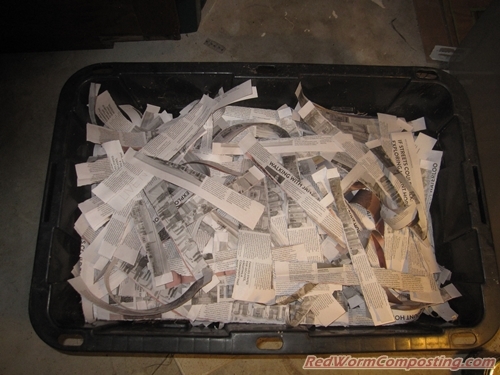 His interesting article is titled “Isopod Composting: From Beginning to Harvest“. I was glad to see Dermy address something I was wondering about – harvesting! Although, it looks like it might be as challenging as I suspected, since the isopods don’t flee from light the way worms do. Based on how fine and dry their “castings” material is, I’m thinking there might be a possibility of screening it with a really fine-meshed sieve. We shall see! Anyway – I think this is going to be a very interesting (and easy) experiment. Sounds like you might be starting a whole new webpage and blog! I always tend to have some isopods (wood lice / roll-e-polley) in my worm inns. I have read several places saying they like to wander a lot. The inns should keep them contained and the drying along the sides should allow them to find a region they like. Your bedding choice is great Isopods seem to love things with Cellulose in them and of course it’d be a pain to get them out of it. I’m looking forward to seeing how you get on with this and how it corresponds to what I’ve gotten as far as my semi-results. Dermy – great to hear from you! Glad it is still working out well for you. Definitely keep us in the loop (and I will certainly do the same)! My experience with wood lice in the bin is both positive and negative. On the positive side, they are prolific breeders, and they break down cellulose (leaves, paper, cardboard) quickly. On the negative side, they love to wander and wood lice in the garden love to eat new shoots. They can decimate a new garden overnight. If there was a way to keep them in the bin and out of the garden (and house), they would be a great addition to the bin, as they make short work of some of the tougher materials in the bin. 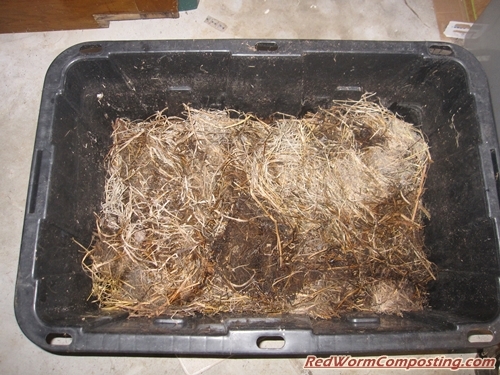 It is not dry in the bin, so I’m thinking that the worms have just receded to the lower levels and are not as visible. My concern though, is that they will not thrive, with all those pillbugs eating up the food on top first. So far, the pillbugs are winning the population game. I’ve been keeping the bin wetter then usual to try to sway the environment towards the worms, but that has not yet changed the trajectory. SCOTT – Thanks for your feedback! AMY – Great to see you ’round these parts! I couldn’t get the cam video to load – but that’s a really cool idea! Interesting that they are thriving so well in a moist bin.